The one concept that above all others plagues human beings, and has done so for all of recorded history, is the concept of duality. It is a hidden enemy, created in wrong thought (relative consciousness), and fed by fear. It has divided the world of man and has been the instrument of more death and destruction than all the terms we commonly use to describe evil. And yet the people of the world, as a whole, continue trapped in the same belief pattern. What is this thing called duality? Virtually every Church and most of the religions of the world have propagated this idea in their doctrine. Why is it such a pervasive idea, and why has it attracted such a following? Many of the precepts of Hermes Trismegistus, an ancient Master in Egypt, can be found within virtually every world religion. It is possible that misunderstanding of this ancient teaching, interwoven with doctrine, may have led to the belief in dualism. Even initiates of Hermetic teachings today write in such a way that can cause confusion. The Hermetic principle of Polarity is presented as all manifested things have two sides, two aspects, two poles, a pair of opposites with manifold degrees between the two extremes. This is a description of Polarity and not duality, but it is obvious how dualism can spring from an incomplete understanding. It is from the doctrine of Zoroastrianism that the universal struggle is described as the forces of evil against the forces of good is derived. A clear understanding of three Hermetic Precepts might give you some clues as to how the fallacy of duality has been derived. 1) Correspondence … As above, so below; as below, so above. To some people this meant two worlds, as opposed to many planes of the absolute unity of Universal Being. 2) Polarity… Everything is dual; everything has poles; everything has its pair of opposites; like and unlike are the same; opposites are identical in nature, but different in degree; extremes meet; all truths are but half truths; all paradoxes may be reconciled. The fact that all paradoxes may be reconciled clearly indicates that all paradoxes are a part of the whole. 3) Gender…Gender is in everything; everything has its masculine and feminine principles; Gender manifests on all planes. So we have multiple planes and the masculine and feminine principles are manifested in each and all are part of the whole. 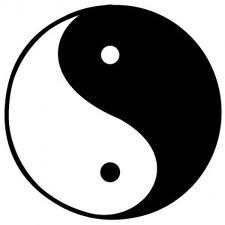 The definition of Polarity which says, “Everything is dual” is taken to mean the world is dualistic. A closer look at each of these precepts and it is clear that while these poles and opposites are present they are present within the whole. Man sees forces on the other side where we go when we die. He wants to believe there are other planes but the experience of life and death chill him. He has a hard time reconciling life and death as just phases of the whole. For those who accept duality, the world is full of calamities that are thrown at them by evil forces, and how well they handle them determines whether they go to heaven or hell. We hear people talk about how a city is racially polarized as if this in itself was proof of duality. In fact, the word polarity is proof of exactly the opposite of duality. Duality is a concept that states that there are two forces, good and evil, warring against each other. It is a lie the intellect has created, and we have accepted. There is only one power, and the other is created in our ignorance by the intellect and fed by our fear. When you say that a city is racially polarized, you are actually confirming the unity of humanity. There may be significant differences, culturally and economically, but polarity simply means the extreme points of one thing. If you have racial polarity all that is proved is that we are all human. The Universal Law is Absolute Unity. The perception is duality. Most theology is dualistic in nature. Only a few Christian churches emphasize that there really is no competing power with God. The Unity Movement has made its statement of belief in the Absolute Unity of all the linchpin of its positive affirmations. Their affirmation is “There is only one power and presence in the universe, God the good omnipotent, the everywhere present Principle of Absolute Good”. In virtually every other theology, the universe is a battleground between good and evil. On the one side we have the Almighty God who created the heavens and the earth, and on the other side we have Satan, a fallen angel who reaches for and has an equal power status on earth. In fact, he is depicted as having control of earth. The world turns, and the battle rages for the souls of men. Everything is defined in terms of good and evil. To say that there is only one power and presence in the universe is not just a statement of adoration and praise to God. It is a statement of principle. It is a statement of the Universal Law of Absolute Unity. When we say this, we are confirming that there is no other power but God. We are in essence renouncing duality and the idea of a second power that can compete and war against God. We are recognizing and affirming that evil and satanic forces are a creation of the intellect and a perversion of the reality of Absolute Unity. One cannot deny that negative and fearful thinking is the cause of negative and fearful consequences. Why? Because all thought creates. Thought will create constructively or destructively, but it always creates. Our world, our lives are our creations. What people refer to as evil might more accurately be seen as the destructive results of fearful, negative and wrong thought. It comes from man’s intellect and creates the perceived barriers to God. It instills in man the belief that there is a separation from God, which has never existed. It cannot and could not be because God is in man and everywhere present. Absolute means ABSOLUTE. If God is omnipresent, he is everywhere. So what could be considered evil? It can only be our perception of separation from God. It has no reality in truth. Even some of the more enlightened religious systems retain a lingering vestige of the thought that man has somehow been separated from God and must go through a process of purification or karmic learning in order to be reunited with God. The Catholic Church has its purgatory in which the last bits of sin and perdition are removed before man can return to God. Some metaphysical schools, while teaching the Universal Laws, have not been able to get past duality. At least one of these schools actually teaches that there is the Universal Law of Duality. We have those who talk about good karma and bad karma. They say that this bad karma has to be paid in order to go back to God. There is no such thing as good karma or bad karma. There is only karma or balance. One might call it bad karma because an experience is unpleasant. However, all experience is attracted because we need the learning experience. In our pain, we don’t recognize or appreciate the experience, but it is part of the Law of Balance and Equalization. How do we know that duality is a false perception, and what do we do about it? We can know through the process of identifying and verifying the Universal Laws in our lives. We can know the fallacy because we can understand the Universal Law of Absolute Unity. We understand that to look for solutions, or to place blame outside of ourselves, is a useless exercise. We know there is only one power in the Universe, and it is everywhere present. What we have perceived as a separation from God is only a creation of the intellect. Even with all the evidence of order in nature, we have been able to see only chaos and destruction in the storm. We forget that it is a product of natural order. In our concept of spiritual things we have perceived God as out there somewhere and heaven as up there! What we have perceived as an evil force is a product of fear created and fed by the imagination of the intellect. The intellect/ego, left to its own devices, seeks to establish itself as separate from the whole. It will go to extraordinary extremes to protect itself and establish its own power. The ego does not need the protection it seeks in separation. It doesn’t need the creation of a great world struggle between good and evil to give it meaning. It does not have to feel smarter, superior or to have been chosen as God’s elite to give it self-worth. It must recognize that it is its own worst enemy because it seeks to block itself from the all-powerful whole of which it is an indivisible part. As Emily Cady writes: All joy and strength and good spring up from a fountain within one’s own being, and if we only knew this truth, we should know that, because God in us is the fountain out of which springs all our good, nothing that anyone does or says or fails to do or say, can take away our joy and good. We must deny fear any of the power that springs from our imagination because the imagination will create constructively or destructively. It will create one way as easily as the other. We must deny the intellect the right to create the barrier. We must recognize polarity is found everywhere and in everything, but understand polarity to be parts of the whole. We must become fully aware that polarity and duality are not the same. The first is a fact of existence and the latter a mutant perversion that exists only as a perception of the intellect. The Kabbalists (Mystic Judaism) say that the spiritual and physical came from the same substance and affirm that the apparent duality is really only a mistaken view of the universe, that in reality there is absolute unity. A barrier need not be physical, like a gate or fence, to be effective, declares David Sheinkin, author of Path of the Kabbalah. Men and women die every day because of the barriers erected from their beliefs. The commonly held worldview I refer to as duality contributes most to the barriers. The concepts of good versus evil and God versus Satan could be overcome with awareness of only one power existing in the universe and the concept of separateness from God as a perversion. Even what we call the spiritual dimension and the material dimension cannot truly be understood as duality because they exist in the same place at the same time. They are a part of the whole. Duality is a perception of man, created by man and is derived from man’s own mistaken concept of his Being. The concept itself remains his greatest enemy because this ignorance of his real nature keeps him thinking that he has been separated from God. The good news from Jesus and other great masters was that God dwells in man. God is at hand within, and all power is available to each of us with the awareness of this presence. God has never left us, and we have never separated ourselves from God because it is not possible. What we have done through the intellect is put on blinders. We have always been with God and will always be with God. We experience in the body for purposes that only the I AM Consciousness knows. It is this consciousness that directs us, and not the relative conscious we know as our ego or intellect. Only human intellect/ego, with its free will, can even conceive the concept of separation from God. Man is the only entity that can come up with this idea! This separation from the Light of God is only in the imagination of the heart where the negative intellect, combined with emotion, strives in a darkness of its own making. We hope this Article brought you value. Please comment or tweet below!! DO YOU OFFER A ONLINE HOME BASED BUSINESS?? PLACE YOUR BUSINESS NAME & URL IN HERE! !